Today, we’re delighted to announce the software update to our Piwik PRO Analytics Suite 5.5.0. The update was rolled out to existing users on February 14, 2018. We’re constantly making these updates for you, so let us know what you think and if there are features you want to see. In this post we’ll walk you through all the details of the latest release so you won’t miss any of the important changes. Let’s get to it! 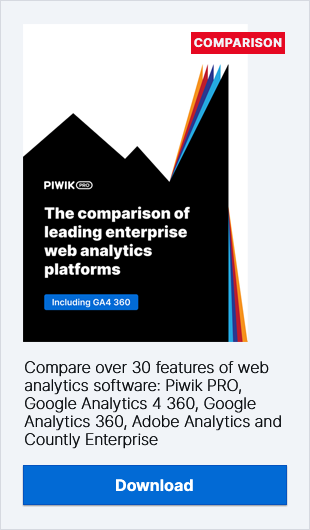 What’s new with the Piwik PRO Analytics Suite? We should start by introducing a significant change to the Piwik PRO platform itself. The platform can now be integrated with external SAML 2.0 identity providers and a single logout mechanism. That’s both a very convenient and highly secure enterprise solution. In addition, changes and advancements to our products have been made. Regarding the analytics features, with the new intranet mode you can now implement web analytics even without access to the Internet. We’ve also fixed issues with insights widgets so you can easily add them to your dashboards and compare data from different periods. Moving along, we’ve added improvements to the Personalization module. First of all, we’ve enhanced the product’s UX with multiple design changes giving it a better look and feel. What’s more, the pop-ups creation process has been significantly upgraded. Now you can personalize and tailor pop-ups using custom HTML. This gives you more flexibility in creating user experiences. Last but not least, there are some serious enhancements to our Audience Manager (Customer Data Platform). Brand-new functionalities have been added along with major advancements. As for development of existing features, we have improved the interface of the Attributes tab, Audience view, and Profile view for a better user experience. Analytics custom events can be used as parameters for creating an audience. Because of the incredible flexibility of custom events, user now have more power to create specific, targeted audiences. Finally yet importantly, CSV import has been improved with the capacity to match imported data with Audience Manager profiles using user_id or device_id. In addition to all these enhancements we’ve added further updates across our range of products. Check out the change log for more details. Piwik PRO Teams Up With Looker!